alison*elle | Vancouver fashion, beauty, and lifestyle blog: What's In My Work Bag? PD Oh, I carry bandaids, hair ties, and bobby pins in my makeup bag too... you never know when they'll come in handy! Oh man... if I did a WIMB post you'd think I'm a bag lady LOL. I love your Miu Miu wallet! i think i'm the type of person who carries her life inside her bag because my fiance always complains that it's too heavy...hehe. great feature on everything in your work bag! I like each description..FUN! Ooh I love the what's in your bag posts. You really do carry around quite a bit! Your bag's contents are so cute though. I love your cosmetic bag, gorgeous! Whoa! That's a lot of lip products! How funny, I never leave the house without a granola bar in my nag too. :) Your Miu Miu wallet is beautiful by the way! Everything is adorable! The strawberry tupperware - I want! I adore your strawberry tupperware box, that is the cutest thing ever. Also a big fan of EOS lipbalm, loving the lemon one at the moment, they are the most moisturising lip balms ever! Pretty Miu Miu wallet :) Super cute! The things that I have in my bag always vary. Lots of random things! i LOVEEEE looking in ppl's purses hahah.. omgosh that strawberry container is SO FREAKIN' ADORABLE!!!! i heart your tory burch makeup bag the print is so cute! i've always wanted to do a blog post like this! i love seeing what other people carry in their bags! thanks for the comment on my blog, hope you will stop by again soon! Love that strawberry thing! Looks so cute! 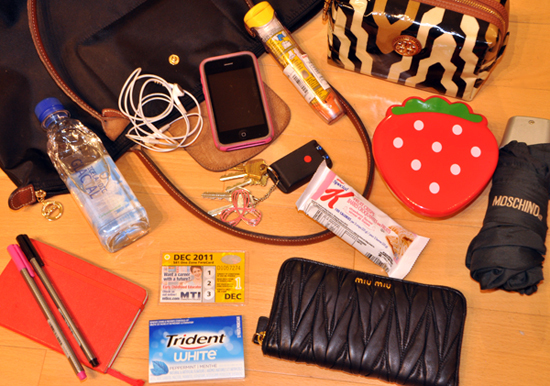 Ooh a whole bunch of really cute things in your purse :) Mine is so boring haha. Dang giiirl, if I ever ran into you in a random washroom I'm totally going to borrow your make-up for touch-ups! LOL. You carry everything in that make-up bag haha. The only thing I carry for make-up is lipstick, and liquid liner. Sometimes eyelash glue, but I always forget it.... I kinda want to start carrying foundation as well just in case my face decides to unpretty itself mid day or something.... -___- or I'll have to hunt you down! lovely stuff in your work bag! ohh your Miu Miu pouch is soo cute! Oh thank you for the epi pen addition haha. I'm pretty allergic to wasps so don't have to worry about carrying it around for the time being, but in the summer it's terrifying and I have to have one on me all the time. Have you ever had to use it? I'm so scared of them, haven't had to use one yet. Bonnie You can totally borrow my makeup, haha! Alexandra I was attacked by a swarm of wasps this summer and stung over 20 times... considering all my allergies I was afraid I was allergic to wasp stings but thankfully not. Scary! Hehe I've noticed a lot of girls carry multiple lip products with them, so don't feel bad!